When it comes to growing brussels sprouts we never usually have much luck. Over the years there’s been many attempts with results ranging from the sprouts being “blown” to a horrible incident from a few years ago we’d like to forget about. A week before Christmas a fox rubbed his rear-end against the one of the only brussel sprout plant leaving a nasty brown deposit on the stalk. Even after the plant had a good hosing down and it was clean as a whistle, it scarred us psychologically (possibly for life) and no way could our sprouts be served at the Christmas dinner table. We had to procure another “leg” of them from the local supermarket even though we’d been growing them for the best part of a year. That don’t make sense does it? This year it has been better, there hasn’t been any incidents nor any sprouts blowing out. We grew a couple of plants from seed (they were tiny in April here) and even though one of the plants are at a 45 degree to the ground (picture above) there are a decent amount of sprouts on it (close up of it below). The other plant has kept straight and has a fair few sprouts on it so you can say we’ve had some sort of success this year! Talking of sprouts and all things festive we here at Weeds wish all our readers a Great Christmas and a Happy New Year! We probably posted this tune up before but what the heck, it’s a festive one! Big shout out to a long gone second-hand shop in Coventry called John’s in the late 1970’s for having this Coxsone Dodd white label blank in its record boxes (which were just beside the owner’s snarling German shepherd). So have a great festive season and may the Bailey’s/Tia Maria (and non-alcoholic cocktails for the non-drinkers out there) be with you! Last autumn I bought a small number of Garlic cloves from Shannon’s and stuck them in the ground over winter and last night I pulled a good few of them out to harvest. I’ll be leaving them against the kitchen wall to dry out a bit. Not a bad harvest for something you don’t have to bother too much with once they’ve been planted. There’s still even a couple of rows left in the ground too! We’ve woken up to a bright and sunny day here in London and just before a day of pottering about in the garden (or more likely, before the clouds go in!) here’s a wonderful bit of music to get you going. It’s Chronixx doing a live set over some classic Studio 1 rhythms from his first appearance at Miss Lilys in New York City in 2012. Miss Lily’s looks a brilliant place, a restaurant, record shop and radio station, all they need now is a little garden centre at the back and it would be an ideal place for us here at weeds! Also, here’s a set Chronixx did there from back in 2014. Some tunes to get you in mood for weeding, watering and taking off that horticultural fleece from the cold night just has gone (which you’ll more than likely be putting back on come this evening!). One for the weekend, sir/madam? An excellent version of the Studio 1 classic “Stars” by Mr Benn as played on David Rodigan’s show this week (well, the instrumental was) and this version features the vocal talent of Eva Lazarus and two great toasts by Blackout and Champian (I take it, it’s the same Champian from the excellent Tighten Up posse, big up Mistah Brown and Tim P.) A top tune that’ll lure the sun back out into action again! 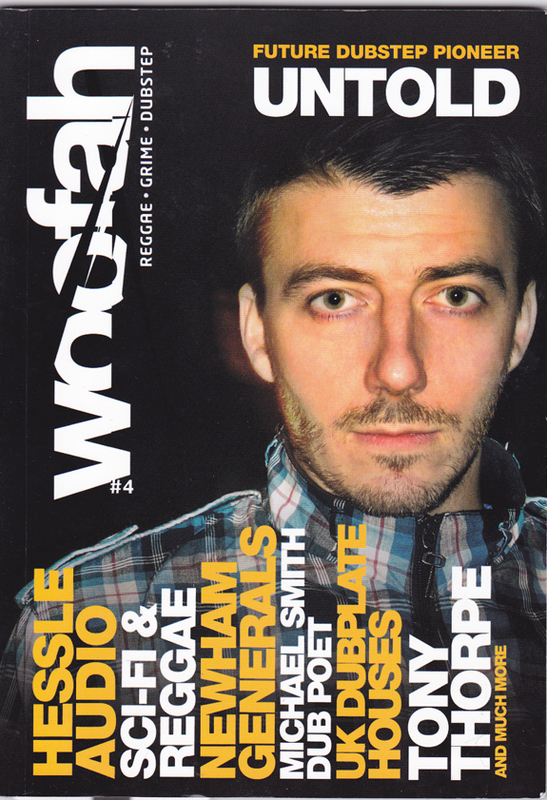 Woofah – Issue 4 (A5 96 pages for £4!) The latest issue of the excellent reggae, dubstep and grime magazine Woofah featuring lots of great stuff, including reggae-wise the late dub poet Michael Smith (“me cyaan believe it”), Joe Ariwa (Mad Professor’s Son) & Young Warrior, YT, UK dub cutting houses, Studio 1 photographer Ron Vester (he mentions that King Stitt used to get loads of female attention) and a great interview with Tony Thorpe of 400 Blows, Moody Boy’s etc (I seen him playing records once at a Saberettes night in a basement underneath the BT tower!). This mag is well designed and well researched with no advertisements and a must for any serious reggae (and dubstep) fan. Big up to John Eden and friends for putting this fine magazine together!